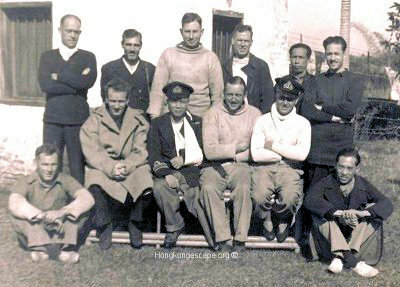 The Chinese Liaison delegation in Hong Kong was led by Admiral Chan Chak who acted as the Chinese-British Commander-In-Chief. Colonel S. K. Yee of the Chinese Secret Service was the Admiral's 2nd in command, Flag Lt-Commander Henry Heng Hsu was the Adm's ADC, and his Coxswain Yeung Chuen who was his bodyguard and an expert in martial arts. Colonel S. K. Yee was last seen on the bullet riddled boat in Aberdeen South where the Adm received a bullet in his left wrist. He escaped via Ap Lei Chau Island separately. Along with S.K. 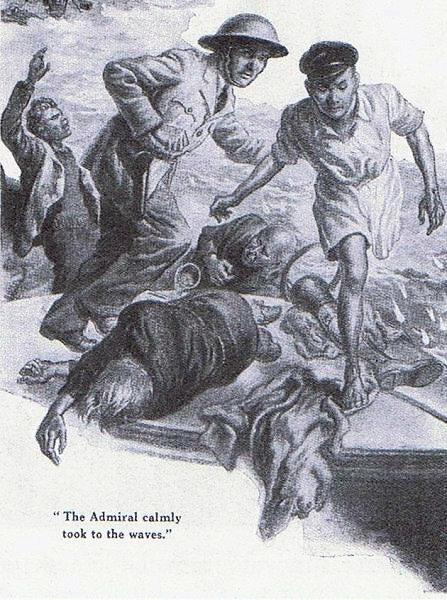 were two severely wounded volunteer crew left in the boat, the tall forty seven year old Jutlander, Alexis (Alec) Damsgaard, late Master of the C.S. Store Nordiske, & Sub-Lt J. J. Forster HKRNVR from Northern Ireland. After drifting all night S.K. bribed a junk man to take the two wounded to a hospital. Yeung was born in Yeung Uk village in Lung Chuen County, Guangdong Province, in 1896, the son of a Hakka peasant family. Without the benefit of schooling, but as a fit, strong martial arts practitioner he earned his living as a rickshaw puller in Canton. One day he picked up Adm Chan Chak, who left his briefcase accidentally in the rickshaw. The bag contained a large sum of money, and Yeung waited several hours patiently to return it. Impressed by his honesty, the Adm engaged him as his private rickshaw puller and he eventually became his personal coxswain-bodyguard. The Yeung and Chan families were very close, their children grew up together and flew kites from the roof of the Yeungs’ home. Yeung Chuen’s personal qualities included optimism, loyalty, generosity and kindness. Yeung Chuen never left the Adm's side, and was holding him when he died unexpectedly after hosting a party at his home on 31st August 1949. Coxswain Yeung Chuen was at Adm Chan Chak's side at all times, being a Martial Arts expert. Photo from "Escape from the Blooded Sun" by Freddie Guest © which had mistaken Yeung Chuen with Hsu Heng (Henry). Admiral Chan chak with his Coxswain Yeung Chuen at Kukong 7th January 1942 where Chan was presented with a shield and flowers. 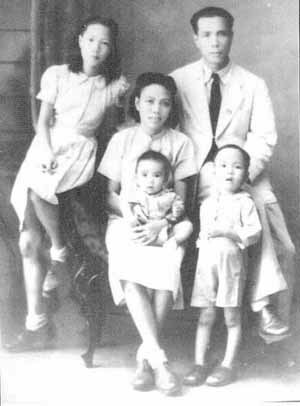 Yeung Chuen with his family after the war. Yeung, as a rickshaw puller, picked up the Adm one day and took him to the anti-narcotics department. The Adm left his briefcase on the rickshaw. Yeung waited outside for several hours and returned the briefcase to the Adm when he came out from the meeting place. The Adm appreciated Yeung’s honesty (there was a large sum of money in the briefcase) and asked if he’s interested in working for someone as a private puller. 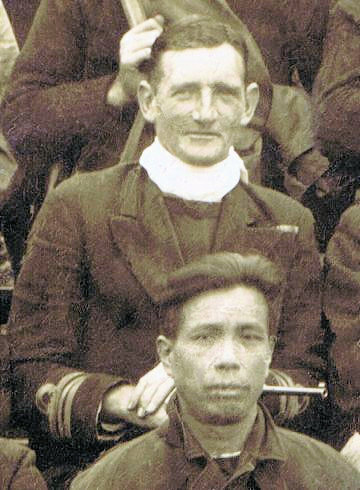 Yeung then started working for the Adm and eventually became his coxswain. A simple act of honesty changed Yeung’s life. 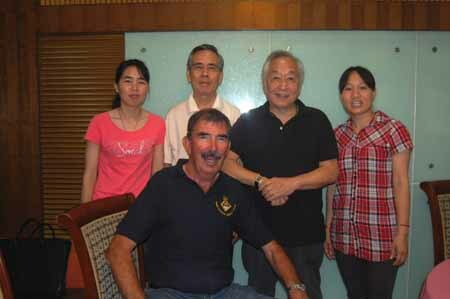 The Adm’s family and Yeung’s were very close. Their children grew up together. Yeung’s family lived in a 3-storey building in Canton. The Adm’s twin son, Donald and Duncan used to fly kites with Yeung’s sons at the rooftop. 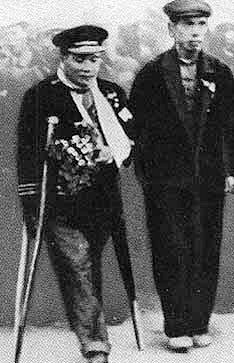 After the escape party arrived in Hing Ling, at the request of the Adm, Yeung changed into peasant clothing, wore a straw hat, carried a gun with him and walked alone for five days back to Hong Kong to pick up the Adm’s wife and children. On his way, Yeung was stopped by two secret service agents. They pulled off Yeung’s hat, exchanged flashes of acknowledgement, then Yeung was let go. After Yeung arrived in Hong Kong, the Adm’s wife informed him that she would leave Hong Kong later on with the assistance of a guerilla of the name Leung. Yeung then returned to Hing Ling and reported to the Adm. At that point, the Adm had to leave for Chung King and told Yeung that he could stay in LungChun. Yeung then returned to Hong Kong one more time to pick up his own wife. Yeung was optimistic, honest, loyal, kindhearted, benevolent, and willing to help other people unconditionally, whether they were known or unknown to him, absolutely no questions asked. 20 or 30 years ago, Yeung was well-known of his benevolence in the areas of Yuet Sau Road South, Man Tat Road South, Chu Kiang Road and Man Fook Road in Guangzhou. Yeung owned certain amount of farmlands and leased them to peasants. However, when the peasants were unable to tender the annual rent due to poor crops, Yeung did not pursue them for the unpaid rent, he even loaned grains to the peasants helping them to survive tough times. During the cultural revolution in the 60’s, Yeung’s house was searched and all effects connected to his earlier military life had been seized by the Red Guards. He had also been interrogated by the Red Guards, however, no one ever came forward to testify against him. Although he was branded as counter-revolutionary at that time, he had not been detained and did not suffer any physical bashing, except that he was not allowed to leave the premises of the village for a number of years.